Luis Suarez is the 2013/14 PFA and FWA Player of the Year. LIVERPOOL AND URUGUAY striker Luis Suarez has won the Football Writers’ Association Player of the Year award. Suarez, who has scored 30 Premier League goals for the Reds this season, won the accolade after taking 52% of the FWA vote. Liverpool teammate Steven Gerrard was second and Manchester City’s Yaya Touré came third. More than 300 journalists cast votes for 10 different players with Suarez the clear winner. 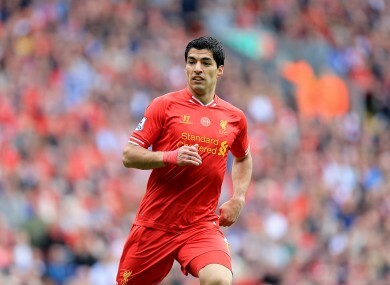 Suarez was also named the PFA Player of the Year, in April. He is expected to attend the awards on 15 May to collect his prize. Email “'Irresistible, ingenious, impudent' Luis Suarez wins football writers' Player of the Year”. Feedback on “'Irresistible, ingenious, impudent' Luis Suarez wins football writers' Player of the Year”.